You’re having a baby! Your friends and family are giving you a shower! Hurry – go register for gifts. But there are so many -which ones are the best? Our pediatric experts put together a list of the five best baby gifts that will encourage your baby’s development from birth through toddlerhood as they master milestones up to walking. Too much time in “containers” of any kind – swings, bouncers, car seats, strollers, carriers – inhibits the baby’s ability to develop strength in the muscles. Babies need floor time to practice lifting their head and strengthening the neck muscles. They need to push against the floor to master rolling over, sitting, crawling and eventually walking. Babies confined to container for long periods won’t have the chance to develop those skills as quickly. Once the baby has good head control, a convertible high chair is the perfect place to practice sitting skills. Bacharach’s feeding program recommends having a good stable sitting posture which requires the right support. A convertible chair will grow with your child from infancy to toddlerhood. Baby wearing is a great alternative to “containers” allowing skin to skin time with your child when the baby faces you. Later, when the baby faces forward, it allows them to work on head control and arm movement, while interacting with their environment. It also takes pressure off the head, unlike carriers which place pressure on the head and can lead to skull asymmetry. Pick something your child can play with while on their tummy, sitting or use to pull themselves up to stand with supervision. This is a toy that will grow with your child for a year. This will appeal to a child that can sit, crawl and stand and is trying to walk. 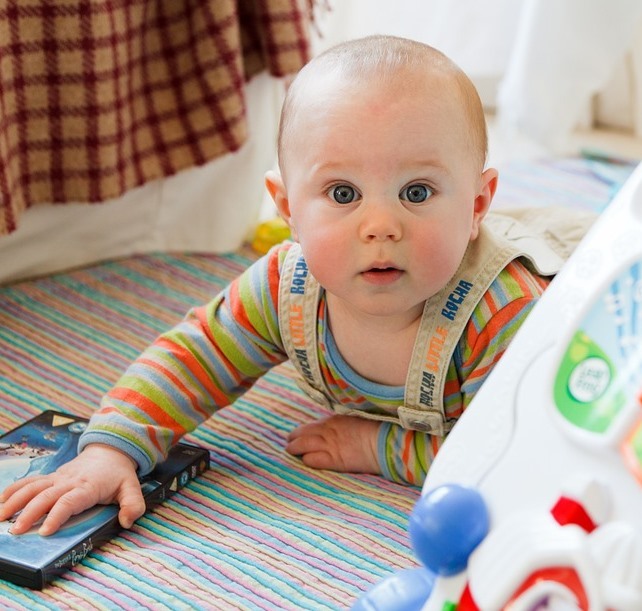 This toy helps babies progress toward walking. It helps the baby work on sitting balance, transitions, leg strength and coordination of the lower extremities for the reciprocal motions needed for walking, running and pedaling.